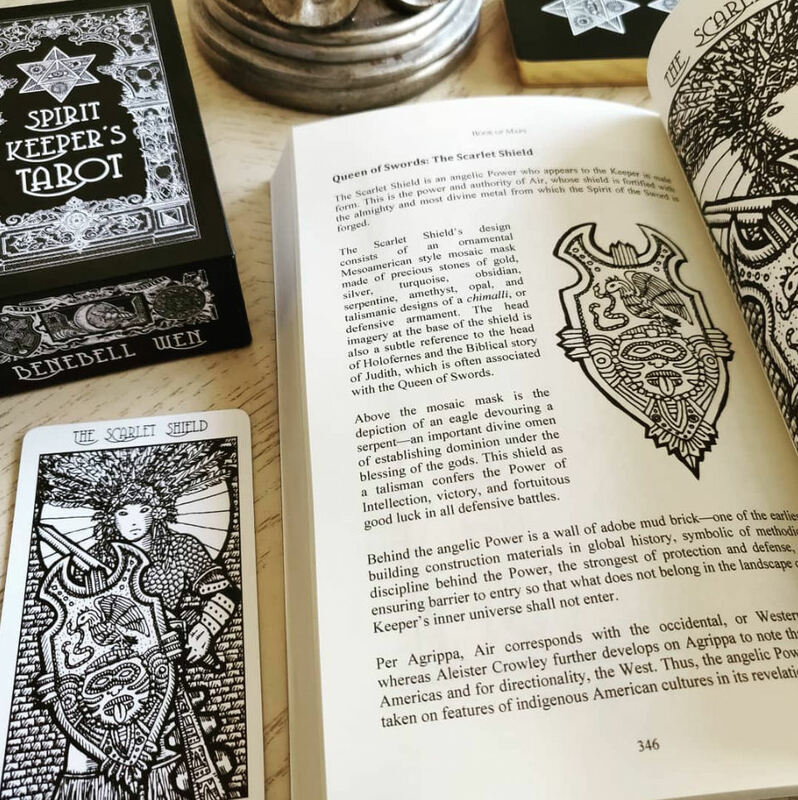 The Book of Maps: Vade Mecum is the in-depth reference manual to the Spirit Keeper’s Tarot deck. 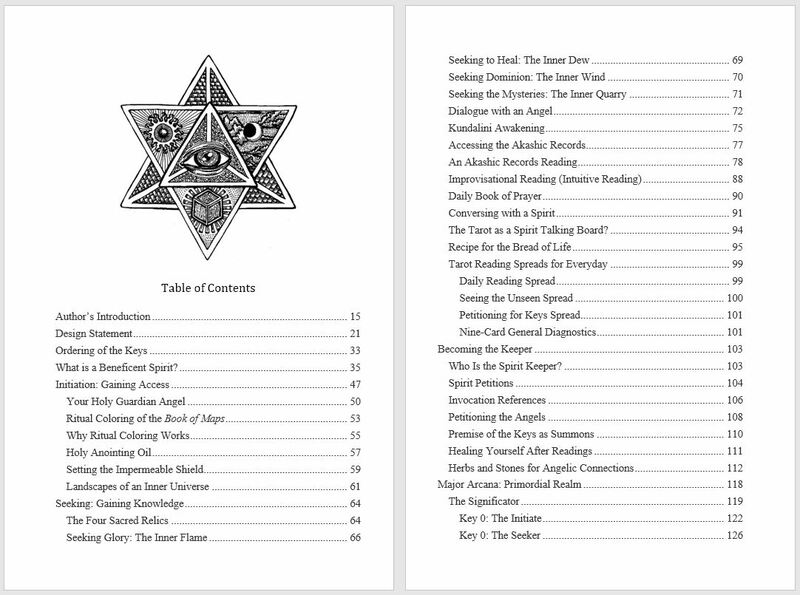 It is a grimoire with instructions on an optional self-initiation to gain a greater scope of access with the deck (where you’ll be coloring in card images in the book, not the cards themselves), some insights on divinatory readings, angel communications, the Hermetic influences in the deck’s symbology, and most significant: the detail by detail explanation for each illustration and a profile for the identity of each Key’s resident spirit and how to invoke or evoke that spirit. 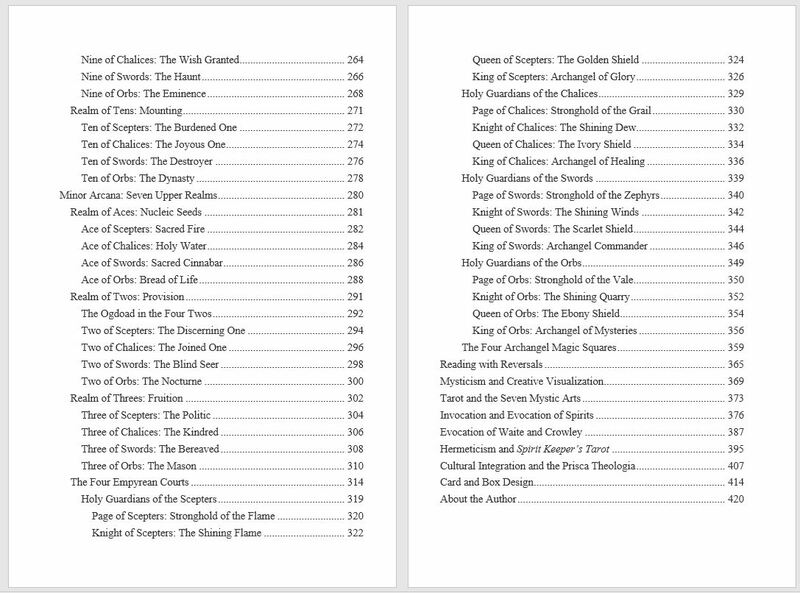 The table of contents is provided below if you’d like to see exactly what topics will be covered in the text. 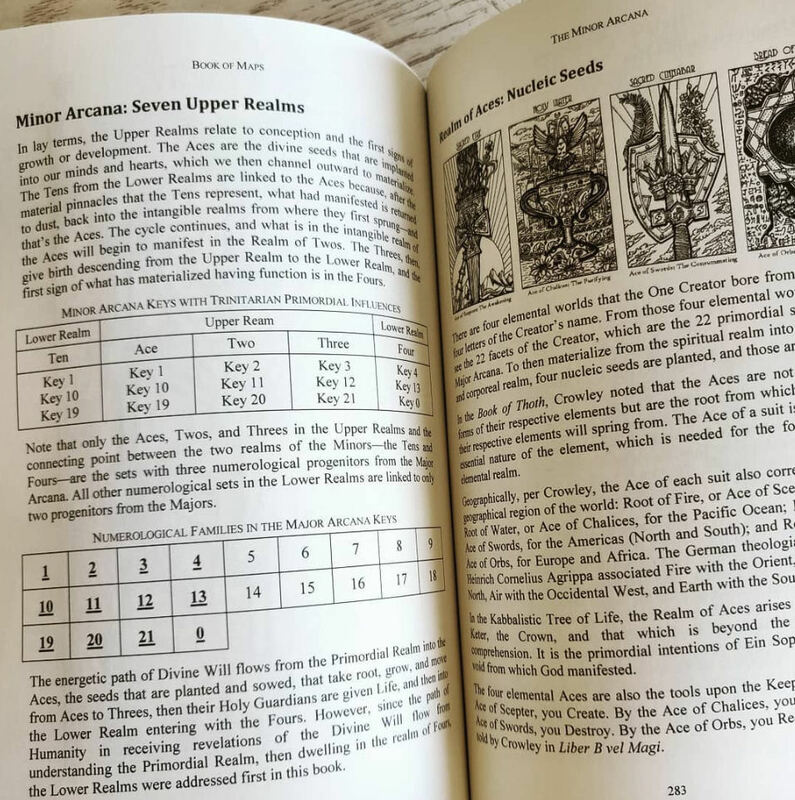 Although I’ve written over 400 pages here, it was my firm resolve that a guidebook should not be required to read proficiently with the Spirit Keeper’s Tarot deck. 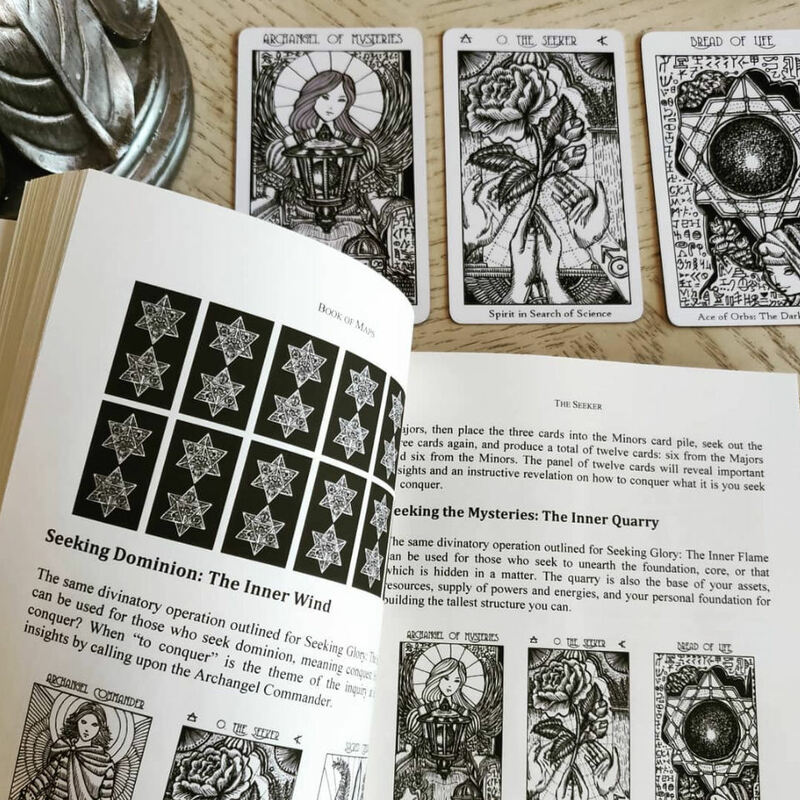 If you’re a beginner tarot reader, then either an RWS-based tarot book, such as Holistic Tarot, or a Thoth-based tarot book will help you to navigate everyday readings with this deck. 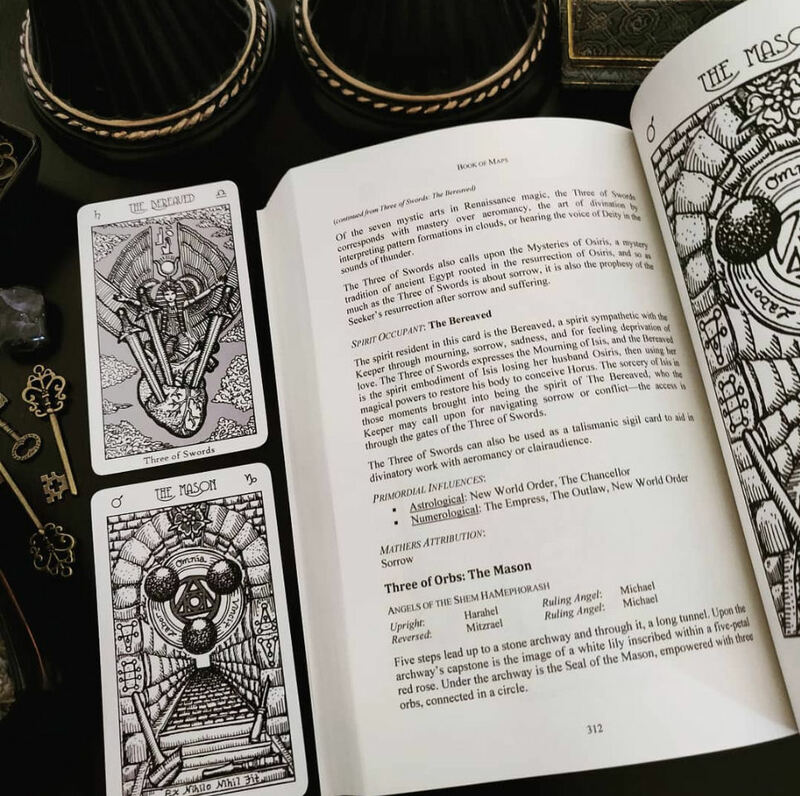 You can even use either The Pictorial Key or Book of Thoth for navigating the cards, as I had intentionally studied and consulted both books for the design of each and every card in Spirit Keeper. 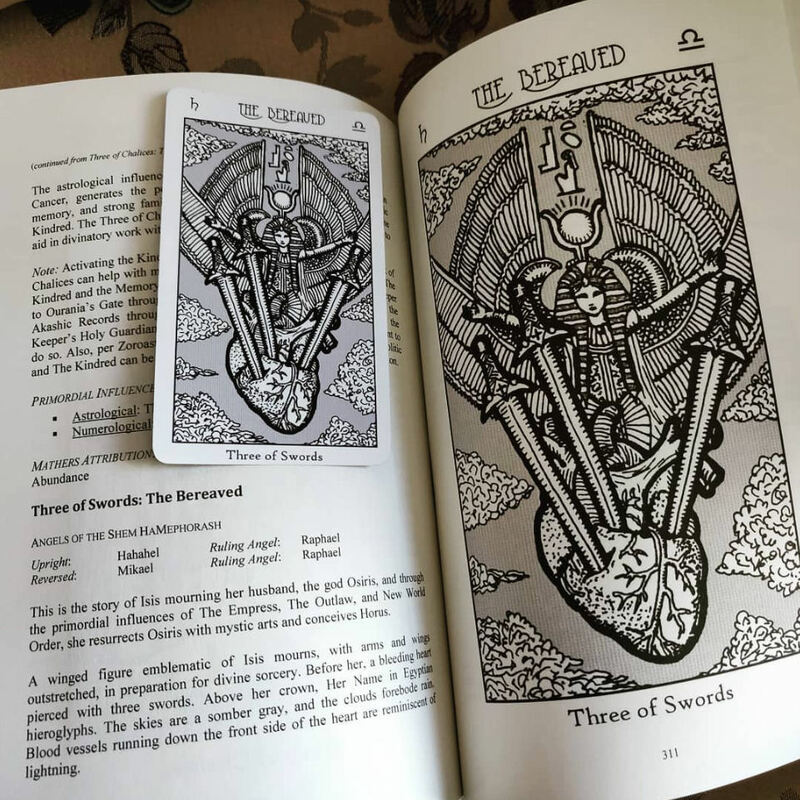 If you’re a seasoned reader with the RWS or Thoth system, then I endeavored to illustrate a deck that you would be able to read with straight out of its box. However, concurrent with the standard reading procedures that I hope this deck accommodates, I’ve also built an underworld to my tarot deck. Navigating that underworld is what’s unique and what may call for some written exposition. Detail by detail, The Book of Maps explains my symbolic significance for what’s depicted on the cards, instructs on the geography of the realms I’ve constructed through the cards’ sigil-crafting, how to build your own inner temple, or inner universe with my architectural blueprints, and how to interact with the cast of beneficent or angelic spirits that you can meet and confer with in the realms of that inner temple. It is customary for a tarot deck’s companion guidebook to explain the card meanings of the deck. I’m taking the guidebook to Spirit Keeper’s Tarot in a different direction. The purpose of this book is to explain Divinity and the alchemical, philosophical, and psychic science of Divinity. The book is a collection of maps that will help you navigate the inner temple where exploration yields realization. In other words, The Book of Maps does not contain card meanings in a way you’d normally find in a tarot book. I already did that in Holistic Tarot. Instead, the symbology I intended for each key is explained, in the way a language dictionary might explain the translation of words, so that when you go to divine with Spirit Keeper, you’ll hear the Voice of Spirit and you’ll be able to make the most of pathworking or meditation within the landscapes of the cards. I would give the caution that The Book of Maps is not a practical guide to the tarot. There are no practical applications of card meanings or a user-friendly set of tarot spreads for you to try. (Again, I already did that… it was called Holistic Tarot.) Instead, this is a book of contemplations and a guide for advancing personal, interactive connections with Spirit. 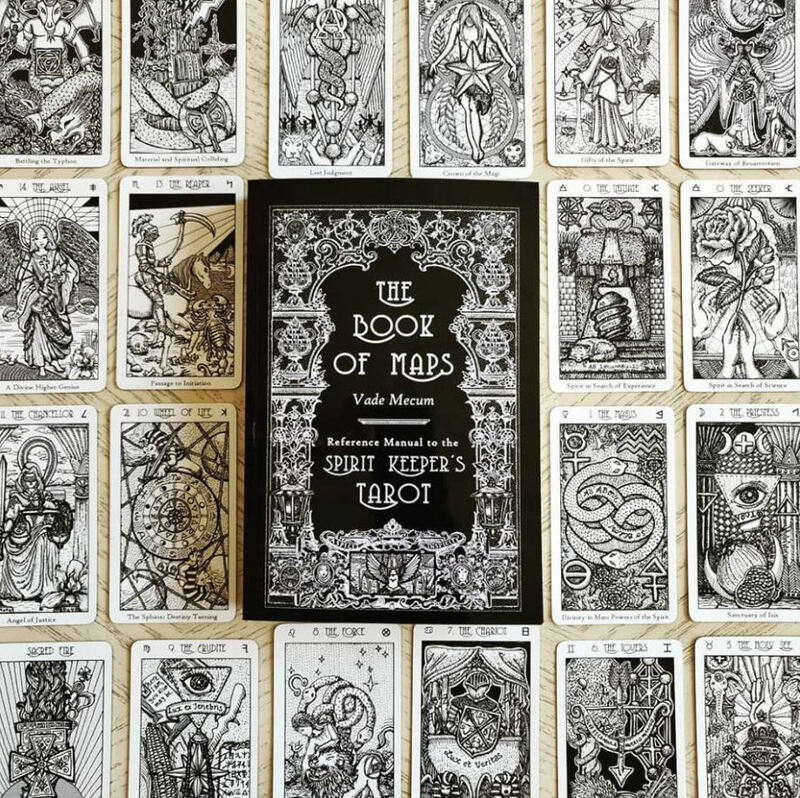 It is also a book that instructs on an animistic perspective of the tarot. Each tarot card in Spirit Keeper is a map of the corresponding dominion of an angelic being. Each physical card is the gateway to that world and the guidebook is a manual for helping you walk through that gateway. The maps are drawn under an esoteric system of cartography and so that’s what The Book of Maps is for: to explain that esoteric system of cartography. 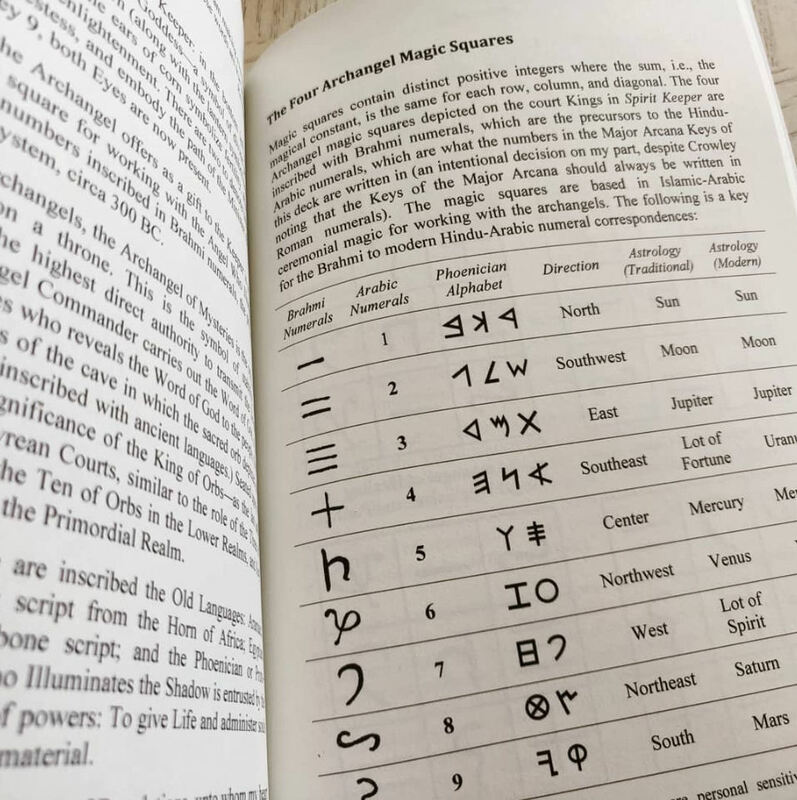 Layout and design of the EPUB and MOBI versions are different from the PDF because the PDF presumes you’ll be printing it into a physical copy of the book and coloring in the card images for ritual initiation. The EPUB and MOBI versions presume you’ll be referencing it off your digital reader for casual reading or passive study purposes only. E-delivery will include step by step illustrated instructions on how to use a third party print-on-demand site to upload and order a physical copy of the book. The PDF version of The Boof of Maps that will be e-delivered to your e-mail inbox is formatted for printing and binding into a physical copy of the text. It’s formatted at the 6″ x 9″ standard trade paperback trim size with set mirror margins. 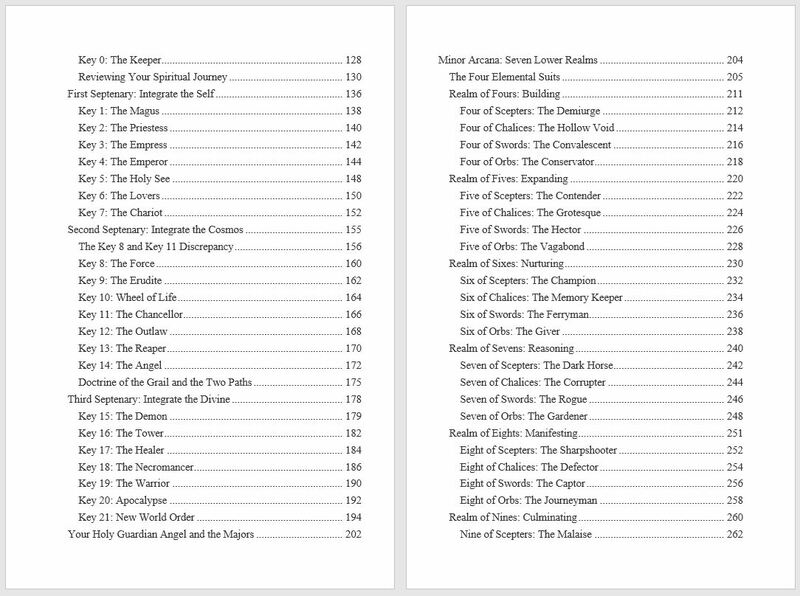 The PDF version also has digitally encoded bookmarks, so if you open it up on your computer desktop in a PDF reader, you can click on the “Bookmark” icon of your PDF reader and skip around from chapter to chapter. Click on the below page spreads to enlarge the image. Click on image file to enlarge.